The smart home market is steadily becoming saturated with devices designed to make your life easier but, as CES 2019 has shown us, our favorite digital assistants no longer need be confined to a smartphone or a smart speaker. Following on the success of its Smart Display, Lenovo has announced a trio of smart devices to add to its Smart Home Essentials range – a Google Assistant-enabled smart alarm clock and a pair of Alexa-powered dockable smart tablets. The Lenovo Smart Clock could easily give the Amazon Echo Spot a run for its money. It features a 480 x 800 4-inch touch-enabled IPS display that's capable of waking you up with light, just like how the Philips Hue smart bulbs do when you set up a “wake up” routine. If you think this is just a glorified alarm clock, though, think again – you can set up sleep routines and control your smart-home setup with a “Hey Google” or “OK Google” voice command, listen to music while you lie in bed, and charge your handheld devices thanks to a rear USB port. For your tunes, there’s a 6W speaker accompanied by two passive radiators capable of filling a large bedroom with sound that’s tuned with Dolby’s background noise reduction technology. The smart clock also features dual band Wi-Fi and Bluetooth connectivity, so you can also hook it up within a multiroom setup. You can also stream shows and movies onto your television by linking it to a Google Chromecast. While its job is to make some sound, the Lenovo Smart Clock is equipped with a mute button, in case you decide you need a sleep-in. And for anyone concerned about their privacy, the clock doesn’t have a camera. The Lenovo Smart Clock is expected to hit shelves around March or April with a price tag of $79.99 (about £63/AU$111). Lenovo is no stranger to Android tablets, but its latest tabs are more versatile than any other handheld device on the market. The Smart Tab M10 and P10 have Amazon’s Alexa built-in and ship with a Smart Dock. When placed into the dock, the tablets automatically switch to a Show Mode, which enables a full-screen experience with the quintessential Alexa interface. Both tablets feature 10-inch FHD (1929 x 1200) displays, have front and rear cameras, are powered by a Snapdragon 450 processor and run Android Oreo. Everything else about them is different. The M10 sports a 2MP front-facing snapper, with a 5MP rear lens. There’s 2GB or 3GB of system memory, comes in either 16GB or 32GB storage flavors and has a 4,850mAh battery under the hood. For your listening pleasure, you’ll get two front-facing Dolby Atmos speakers. The more powerful P10, however, ships with a 5MP front camera and an 8MP rear snapper, has up to 4GB memory and up to 64GB storage. Four front-facing Dolby Atmos speakers give it bigger sound and a 7,000mAh battery keeps it alive longer than its less-robust sibling. The Smart Dock also has its own feature set. There’s dual 3W full-range speakers on the dock itself, and it's capable of picking up voice commands thanks to three far-field microphones. It will, of course, charge the tabs via pogo pin connectors. When docked, the Lenovo Smart Tabs will essentially become an Amazon Echo Show competitor. The Smart Tabs will be available this month with the M10 priced at $199.99 (about £157/AU$280) and the P10 set at $299.99 (around £235/AU$418). We’re as yet uncertain whether the Smart Dock will need to be bought separately or whether it ships with the tabs, but we’ll keep you updated on cost and availability when we know more. 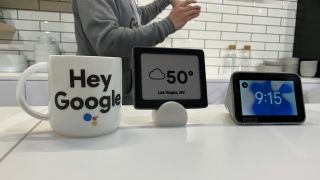 Check out all of TechRadar's CES 2019 coverage. We're live in Las Vegas to bring you all the breaking tech news and launches, plus hands-on reviews of everything from 8K TVs and foldable displays to new phones, laptops and smart home gadgets.